Ok, yeah, I went back to Lainey Gossip to see if there were any more New Moon goodies. Sure enough! 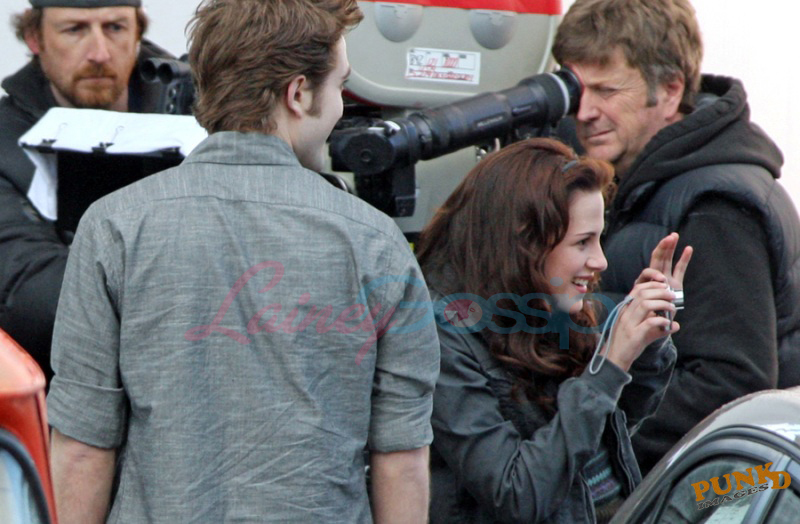 In a shot or two Kristen is holding a camera. It looks to me like they’re actually rolling here or at least setting up for a shot. If that’s the case then I think this must be when Bella brings her new camera to school to take pictures for her new scrapbook. I hope they are filming. 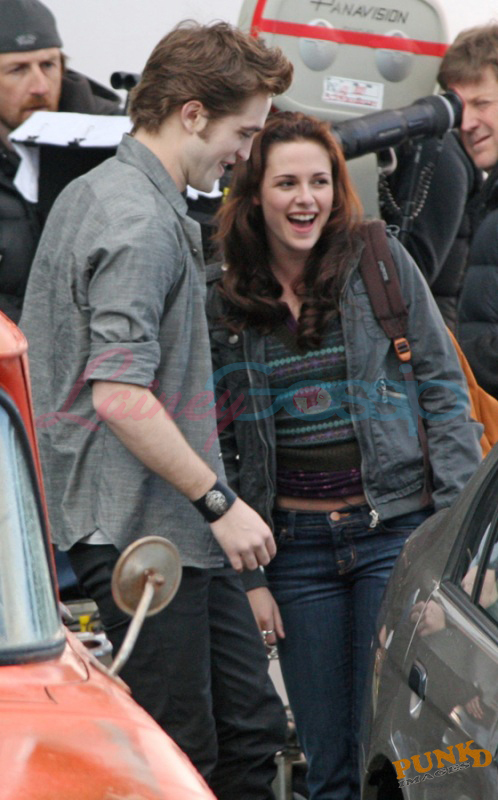 It would be nice to see Bella smile and laugh, and maybe even blush. Just as long as the happiness doesn’t go on too long, if you know what I mean. For the first time ever I went to Lainey Gossip. It’s true. I couldn’t resist. Twilog posted a few pictures of Rob as Edward on the New Moon set in Vancouver. I had to go see the rest, as you will. Here’s one that I’d like to discuss. First, the hair. Lookin’ good! And the make-up! So much better! But are those contacts I see or has someone doctored the photo? If they’re contacts, does this mean that we’re in for more contact slipping fun causing difficulty making eye contact? Is he going to be distracted by the pain and unable to really connect? Did they give him a different kind of contact that’s easier on the eye? I gotta know!